It's been busy these last few days for me! We have a baby shower here this weekend so I've been busy finishing up some things for that and finishing some sewing projects. So today Matt is sharing his recipe for plantain, goat cheese and honey balls. They are delish! First, preheat a sauce pan to medium heat and add your oil. 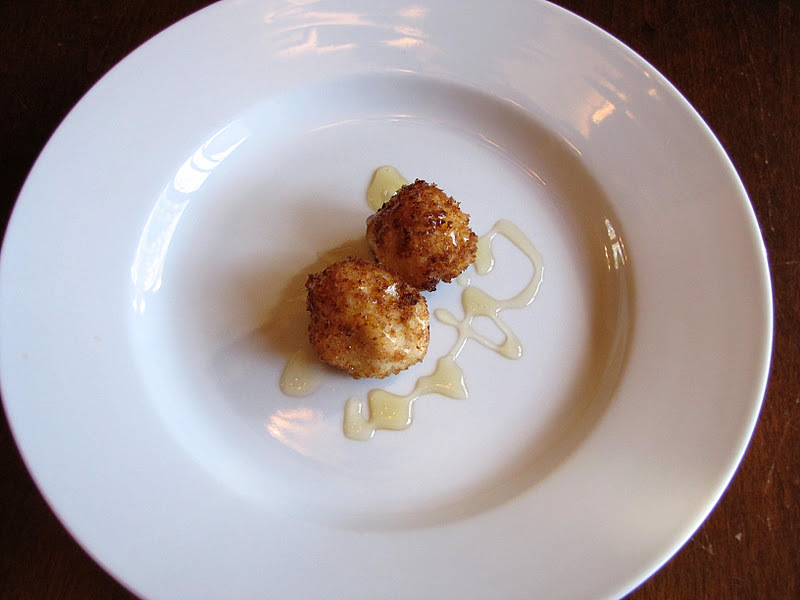 You want the oil to be lightly bubbling before trying to fry your cheese balls. Once you have the oil getting hot on your burner, you're going to finely dice your plantains (which are more starchy than bananas). The smaller you can dice them the better. After dicing them you want to mash them with a spoon. Once the preparation for the plantains is complete. Add the mashed plantains with the goat cheese and sour cream into a mixer. Once the mixture is thoroughly combined add the honey slowly until slightly sweetened. You will need one regular size spoon which you'll use to portion out the combined mixture. You want to make them bite size. Once portioned, roll the mixture in the panko bread crumbs. This recipe should result in between 40-50 goat cheese balls. I used a large slotted spoon and fried these individually; however, if you have an actual frier you could drop them in the frier. Frying time for each ball was roughly 30 seconds but just watch for the ball to golden then remove and let dry on a sheet pan covered with a paper towel. They can be served warm or at room temperature. I like to garnish with honey and crushed macadamia nuts.